L-R: Agustin Villarama, AVP for Marketing, YKK Philippines; Alson Ng, Regional Marketing Manager, YKK Holdings Asia PTE LTD, RFM Coach Pablo Revenga, Tadashi Koshio, President, YKK Philippines, Inc.; Atty. Edwin B. Gastanes, Gen. Sec. Philippines Football Federation; RFM Coaches Hector Vicente and Santiago Sanchez Martin. 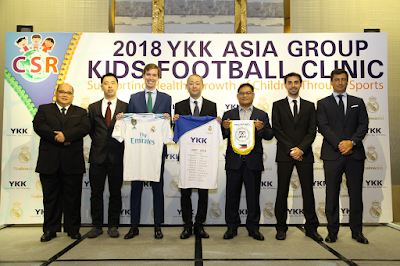 MULTI-TITLED Spanish football club Real Madrid together with YKK Holding Asia PTE. Ltd. (YHA) and YKK Philippines, Inc. pays it forward to young Filipino football players as the YKK Asia Group Kids Football Clinic kicks off today at the McKinley Hill Stadium. Real Madrid Foundation coaches Pablo Gomez Revenga, Santiago Sanchez Martin and Hector Vicente trained 30 local football coaches immediately after the Press Conference held at Shangri-La at the Fort on June 22 to prepare for a two-day clinic for kids aged 8-15 on June 23 and 24. The Real Madrid coaches from the most multi-titled La Liga team in history with 33 Championship titles to its name, shared and demonstrated world-class training methodologies and training techniques to the local coaches, who will in turn assist the Spanish coaches in the Saturday and Sunday kids clinics. 300 underprivileged children from three NGOs – Child Hope Asia, Gawad Kalinga and a community in Batangas -- will learn football over two days of fun and interactive training sessions from the three RMF coaches who will also share footballing tips, techniques and basic fundamentals with the young athletes. The clinics have morning (8:30 a.m.) and afternoon (1:30 p.m.) sessions at the McKinley Hill Stadium. The YKK football clinic was first held in the Philippines in 2012, and this second installment once again gives more local kids and coaches an avenue to experience world-class football from the international coaches. "Our objective is to give the underprivileged the chance to be part of this football clinic. YKK's presence in the Philippines dates back since 1978, and our growth and success during these 40 years owes a great deal to the local society which our customers and employees also form part of. It is a great opportunity and pleasure for us to give back and help create the initial spark of encouragement for children who do not normally experience big name events due to its exclusivity. This time, it’s their turn to experience greatness," said President of YKK Philippines, Inc., Mr Tadashi Koshio. "We hope this clinic will develop more players and inspire other players," said Philippine Football Federation General Secretary Ed Gastanes during yesterday's press conference at the Shangri-La at the Fort in Taguig City. “We are always pleased that the Real Madrid Foundation is bringing their style of play and style of coaching here. 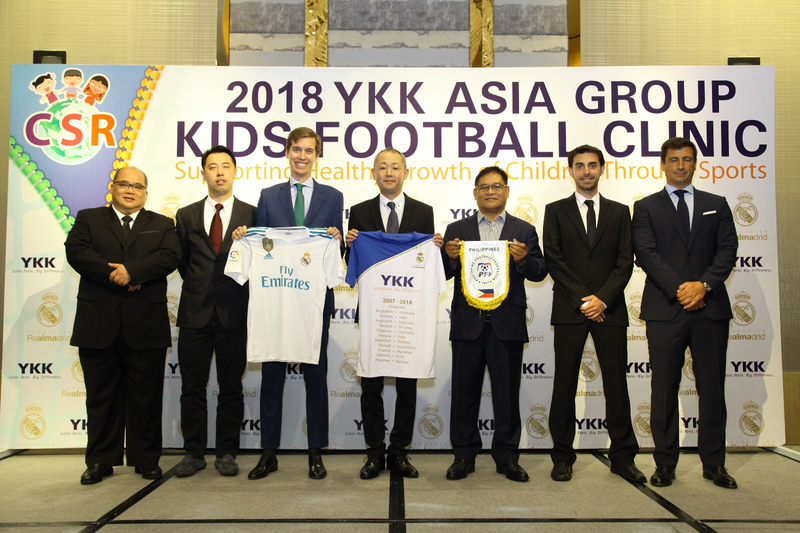 We are happy that YKK Asia Group and YKK Philippines have partnered with Real Madrid Foundation for another meaningful and significant clinic," he added. "Watching local coaches and children engage and participate in a sport which knows no language or social barriers is the ultimate reward," added Revenga, who is Real Madrid Foundation's technical management clinics and international technical schools director. Each participant in the clinic receives a full set of YKK/Real Madrid Foundation football jersey kit which includes football boots, a cap, socks, and a certificate of participation. Other sporting equipment such as footballs, sports bibs and training cones will also be provided by YKK over the three-day event. Furthermore, YKK will donate all footballs and training equipment after the event to the invited NGO. NIL. Wala. Pero Meron Talaga!